Plot: It’s the late ’70s, and the daredevil is king. Evel Knievel, the most daring devil of them all, rules the roost. 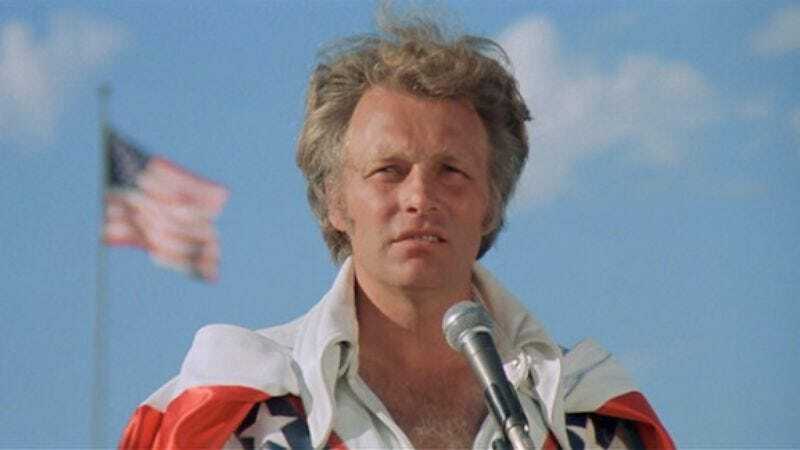 Between jumping over things for money and smugly basking in the adoration of thousands, Knievel likes to spend his spare time thwarting drug dealers, wooing feminist reporters, and reuniting reluctant fathers with their cast-off sons. He even manages to put in a trip to the local orphanage, where he charms the head nun and inspires a crippled child to walk again. Knievel has a crack team to help him on his quest to bring absurd self-endangerment to the masses. Red Buttons runs the business side of things, and Gene Kelly makes sure all the equipment is running perfectly before Knievel violates the warranties. Of course, they have their faults. Buttons tends to take a little more money than is coming to him, and Kelly is a washed-up motorcycle jumper with a booze problem. But Knievel is up to the challenge: He catches Buttons gouging him and gets his fair share of the cash, and does his best to restore Kelly’s wounded confidence. He even has Kelly’s estranged 10-year-old son shipped in for the summer, in hopes that father and spawn might share some tender moments. Not everybody loves the man in the red, white, and blue jumpsuit. Leslie Nielsen, a sports promoter with ties to the drug industry, plans to smuggle $3.6 million worth of cocaine into the country from Mexico, and he needs Knievel to do it. Nielsen convinces Marjoe Gortner, a former friend and rival of Knievel’s, to get the daredevil king to make a trip down south. The plan is to rig one of Knievel’s bikes to ensure he dies during a stunt in Mexico, then transport his body back to the States in a trailer stuffed to the gills with hidden drugs. The border patrol will be too grief-stricken over the death of the Last Gladiator to search the trailer, and then all Nielsen has to do is sell the coke—presumably to schoolchildren—and reap the rewards. Key scenes: A man as magnificent as Knievel needs a love interest to match his prowess, and he gets one in the shape of the vacantly argumentative Lauren Hutton. Hutton is a reporter and photographer sent to cover Knievel’s jumps, in hopes that he might die in the act. But she starts to soften when Knievel takes her for a ride around the stadium on his motorbike, doing wheelies and spinouts to beat the band. Sure, she’s all sarcastic afterward (“I guess the exciting part is the jump, huh?”), but she’s clearly falling for the sweaty hunk of cheese. After a pep talk like that (as well as quick visit from a silk-pajama-wearing, single-rose-bearing Hutton), it’s only a matter of time before Knievel is back on his feet and heading to Mexico to make a cool half a million dollars. Nielsen’s plans seem to be coming to fruition until Gene Kelly, after freaking out King Kong-style during a barrage of flash photography, remembers Gortner drugging him earlier and taking pictures of the Knievel-mobile. But that’s no problem for Nielsen! He simply has Kelly forcibly injected with cocaine and locked away in a nearby sanitarium, where Kelly can go insane under the watchful eye of sanitarium head Dabney Coleman. Sign that it was made in 1977: The fashion sense is nightmare-inducingly awful. Gene Kelly’s lapels alone could drive a man to self-medication, and the orange-sorbet-colored jumpsuit Knievel wears during the last battle, when he and Kelly have to rescue Hutton and the kid from Nielsen and his henchmen, would get laughed off the screen in a soberer decade. Timeless message: No evil can defeat Evel. Knievel takes out the thugs (including Cameron Mitchell), and after a quick side-trip through a Mexican village, manages to trick Nielsen into driving off a cliff to his fiery death. Also, don’t inject nitro, because that would be bad. But hey, maybe he’s still reeling from Hutton finally admitting her love. She apologizes for her callousness earlier, and tells him, “I don’t ever want to see your last jump.” Thankfully, she won’t have to, at least not in Viva Knievel! For insurance reasons, all the dangerous jumps in the film were performed by stuntman Gary Lee Davis. Viva Knievel! is available on DVD from Warner Home Video.